That's Carol, our bus driver The scenery in Montana was stunning. We played three shows there on consecutive nights in Butte, Helena, and Billings. Montana does indeed have a big sky! We played a show in Gillette, WY and the next day we had a 500 mile travel day (no show), during which we also visited Devil's Tower, the Crazy Horse Memorial, and Mt. Rushmore - all in one day. My roommate from my senior year in college played the bass. I played piano and accompanied her on her junior recital. She is one of my permanent lifetime best friends. During college I was so wrapped up in the piano that I never dreamed that I would end up playing bass. I was always fascinated to watch Jennifer playing in all of the school ensembles. It just looked like so much fun! I was so happy that I got to play piano for her recital, and she even gave me a bass lesson. I had no idea at the time that this would eventually lead to me starting lessons for real several years later. It was a strange feeling to be a beginner on a new instrument at that age, and since I was just doing it for fun I did not expect much to come of it. Little did I know that it would eventually take over my life. Thanks Jennifer! I have always loved playing the “In the Mood” show that I am currently touring with. It is excellent, well written, and a real crowd-pleaser. It is so rewarding to perform because it touches so many people on so many different levels. As a woman on the bandstand playing 1940s music, it is particularly moving to me when an elderly woman comes up afterwards and tells me how she and some of her friends played in a band during WWII because of the vacancies created by all of the boys going to war, and how she really missed it after they came back, and that it was so special for her to see me up there on the bandstand playing “her” music. That always brings tears to my eyes. And it has happened at least five times during the past three years of this tour. I know that these women probably weren’t playing with the “big boys” in the major bands during WWII, and neither am I now, but it is still thrilling to realize that my presence on the bandstand is appreciated by certain members of the audience in such a special way. 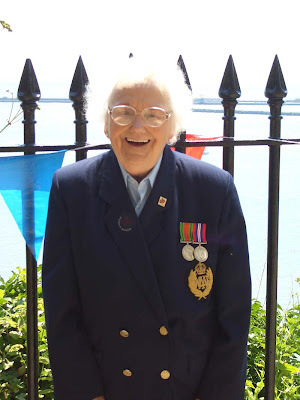 I met a woman during the Victory Day celebration this past July at the “White Cliffs of Dover” My ship just happened to be in docked in Dover on that particular holiday and I went up to the castle to check out the festivities. This woman had worked there in the secret tunnels under the castle during WWII and also played drums in a military band, but she said she was only allowed to do that during the war. The fall tour is starting soom and I am thrilled to be able to have a piece of my former life back and to get away from all of the depressing fire-related issues that we have had to deal with. The inventory is finished and all of the receipts are accounted for and all we have to do is have fun touring and planning our new house. And it will be nice to have a steady income for a while because our credit cards are almost completely maxed out. The insurance company has not reimbursed us for much yet, and we really need the money. This will be our 4th year doing this show. It's a musical revue with singers, dancers, and an on-stage big band. We travel all over the country in a big tour bus, playing mostly one-nighters. It has been great to have a gig like this that we can both do together. The show is excellent and we both love to travel so it is a really nice situation over all. Last year Doug became the tour manager which is very much a mixed blessing. It pays a little bit extra, but it requires him to spend months ahead of time arranging the hotel and travel details. I've helped him quite a bit with that but he does most of it It's a huge job and it has been a good opportunity for him to learn how to become more organized. It's been nice to be able to plan some sightseeing along the way too. Unfortunately we don't get to hang out as much as we used to while on tour because of all of his assorted duties. The overall experience of Doug being tour manager is really less than ideal, but I guess we need the money and supposedly that is why he's doing it again. He had been considering not doing it but I think he talked himself back into it while I was out on my cruise gig. I guess it didn't occur to him that if he'd spent the time that he spent working on all of the tour details making mouthpieces instead, we would be significantly better off in the money department. And we had so much more fun during the first two years of the tour than we did last year when he became the tour manager. Maybe this year will be better now that he's gotten accustomed to his various extra duties. This fall the tour starts in Idaho and we'll be doing shows in Washington, Idaho, Montana, Wyoming, South Dakota, Iowa, Minnesota, Nebraska, Kansas, Wisconsin, Illinois, Michigan, South Carolin, North Carolina, Virginia, New York, Pennsylvania, Ohio, and Massachusetts. All between September 12th and November 19th. Should be fun!! !